Two anonymous sources have said that Saudi journalist Jamal Khashoggi was killed at the Saudi Arabia consulate in Istanbul following his disappearance on Oct. 2. 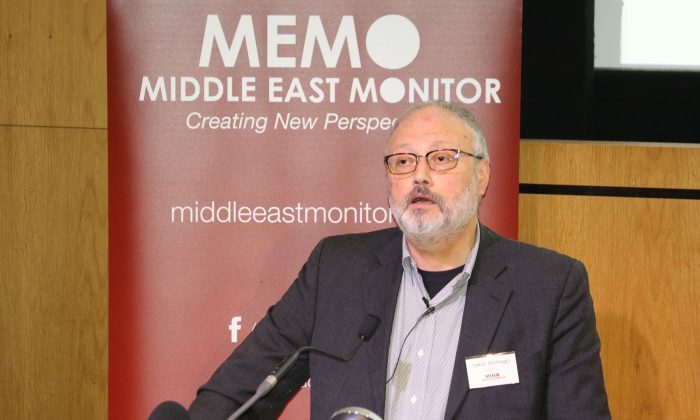 The two sources, who spoke on condition of anonymity, said Turkish investigators believe the 59-year-old journalist was killed inside the Saudi consulate in a “preplanned murder” by a team of 15 people, The Washington Post reported Oct. 6. Khashoggi entered the Saudi consulate on Oct. 2 for matters related to paperwork needed to marry his Turkish fiancee. He has not been seen or heard from since. Reuters also reported on Oct. 6 that two Turkish sources, whose names were not disclosed, said Khashoggi had been killed. “We believe the murder was premeditated and the body was subsequently moved out of the consulate,” one of the anonymous sources told Reuters. The sources did not say how they believed the killing happened. Head of Turkish Arab Media Association Turan Kislakci said Turkish officials had told him that Khashoggi’s body was “dismembered,” The New York Times reported on Oct. 7. The Saudi consulate has dismissed the claims, saying that Khashoggi left their premises alive. A security team of Saudi investigators arrived in Istanbul on Oct. 6 to investigate Khashoggi’s disappearance, following a request by the Saudi government, SPA reported. The Turkish source added that Turkish officials were trying to identify them. Turkey’s Anadolu news agency also reported that the group of Saudis were briefly at the consulate. The United States is seeking more information, a State Department official told Reuters. Khashoggi had been living in the United States for the past year in self-imposed exile, fearing retribution for his criticism of Saudi Arabia’s conservative Sunni Kingdom, following the ascension of Crown Prince Mohammed bin Salman, now next in line to succeed the 82-year-old Saudi King. Khashoggi was a director of a satellite news channel, Al-Arab, owned and backed by Saudi billionaire Prince Alwaleed bin Talal. Alwaleed was detained in a Ritz Carlton hotel for two months alongside some 200 other princes and high-level officials in Nov. 2017. He was thrown in jail in January for graft charges, but has since been released after he reaching a settlement with the authorities. The group was arrested as part of a large-scale anti-corruption purge that targeted anti-semitic and anti-American clerics, authorized by the Saudi king and carried out by Crown Prince Salman. Khashoggi is a familiar face on political talk shows on Arab satellite television networks and used to advise Prince Turki al-Faisal, a former Saudi intelligence chief and ambassador to the United States and Britain. There is more to Saudi Arabia than meets the eye, and a recent purge of Saudi princes and powerful leaders may have cleaned up a network of corruption that had grown forms of control and influence into the West.